Revolution assistant corps director Chris Magonigal submitted this photo and caption. I'm sure we have all been here. During the hustle and bustle of rehearsal camp, somehow the musical score gets "misplaced" and you have to improvise. 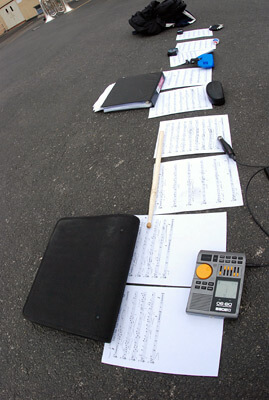 While rehearsing outside, this is when the contents of your backpack come in very handy to insure against a gust of wind.